The EZ10 electric vehicle will run along a route of nearly one kilometre. 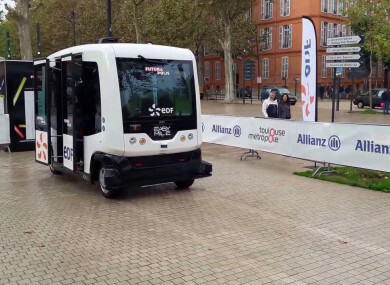 THE FIRST DRIVERLESS public transport vehicle in Ireland is to take to the streets of Dublin today and for the weekend. The EZ10 electric vehicle will run along a route of nearly one kilometre from the Convention Centre Dublin to the 3 Arena as part of an event running today and tomorrow. The Future of Mobility Event is organised by Dublin City Council and is taking place in Dublin’s Docklands as part of European Mobility Week. The EZ10 vehicle is made by French manufacturer EasyMile and has room for 15 passengers. The vehicle doesn’t need any special road infrastructure to operate and it is currently in operation in about 20 countries worldwide. The EZ10 has advanced cameras, processors and sensors to allow it to complete relatively short journeys. It is primarily designed to carry passengers for distances of up to a mile. Passengers wishing to take a ride in the vehicle in Dublin tomorrow can do so by booking free tickets. The first journey of the vehicle on Irish roads will take place this morning at the Convention Centre and will involve representatives from Dublin City Council and Science Foundation Ireland. Email “A driverless public transport vehicle is to take to the streets of Dublin for the first time today”. Feedback on “A driverless public transport vehicle is to take to the streets of Dublin for the first time today”.